Similar in form to another wedding ring set that fit together, the shapes of these rings allow them to nestle closely together. Rings such as or similar to these could also be made of gold. 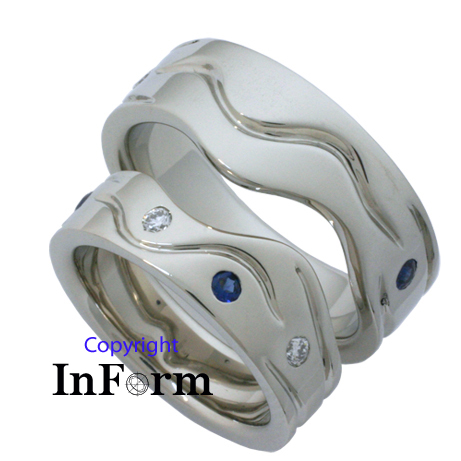 In addition to the interactive shape and form of the rings, they are further embellished. On the surface of the upper portion of each ring, there is a serpentine line extending approximately a third of the way around the ring. Set in the bride's ring are an alternating series of diamonds and sapphires that fit amongst the curves of the line. 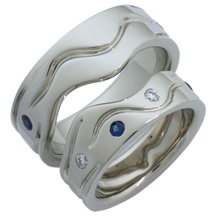 In the groom's ring, there is a single sapphire set near one end of the serpentine line and a diamond near the opposite end.